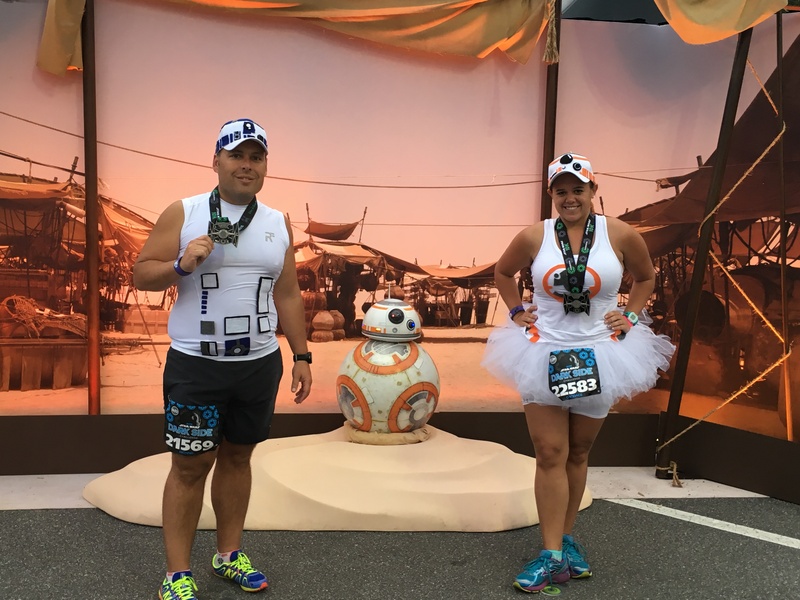 I really want to get right to my review, so be sure to see Mike’s event review and my review of the Star Wars 10k for thoughts on the expo and swag, but I will add a reprise of my quick shout out to runDisney for having BB-8 there! I love me some BB8. 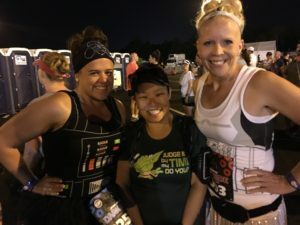 The race start time was 30 minutes earlier than the Star Wars 10k the day before. For that I had suggested we leave fairly early so we could get some character photos before the race, however with the earlier start time I felt getting there early for character pics was not a necessity and thought that leaving at 3:15 or 3:30 a.m. would still be a good idea for this race. Mike quickly informed me that this would not work because the last bus left at 3:30 a.m. according to the sign in the lobby of All Star Sports. I pulled out my official event guide from the expo and showed him in the event guide that buses were running from resorts to Epcot from 2:30 a.m. – 4:30 a.m. However, upon further reading the event guide a few bullet points down it did state that race participants had to be on a bus no later than 3:30 a.m. This could have been very confusing for participants unless they read the fine print, all of it. We also learned from friends staying at Yacht Club that they were given runDisney Event times guides that stated that runners could board buses up until 4 a.m. So there was some confusion among runners of times to be at the race due to the contradictory information on official runDisney materials. In the end we decided we would board the bus at 3 a.m. 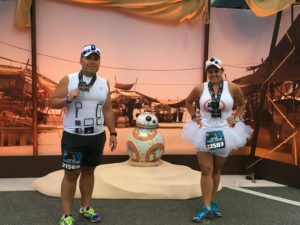 I had put a lot of work in Mike and my costumes for the Star Wars 10k (Coming Soon: I wills share with you how I put together my BB-8 costume in a future installment of Cosrunning!) 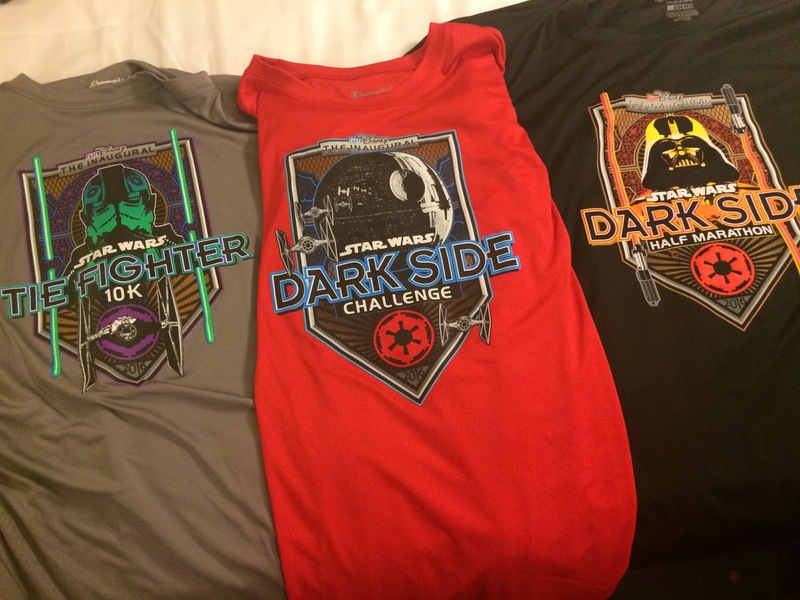 so my half marathon costume ended up being a quickly pieced together outfit that was inspired by Darth Vader. 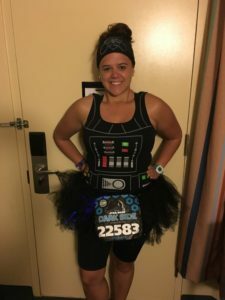 I went with a Darth Vader tank top, black tutu with blue fiber optics in it (which are always a huge hit with my fellow runners! ), a black headband that I used puffy paint to paint Darth Vader’s mask on and black compression shorts. My running gear also included was my VSX Incredible sports bra, Steigen running socks, Brooks Adrenaline GTS 16 running shoes, Garmin running watch, iPhone, headphones, running belt, and 4 salted caramel GUs. 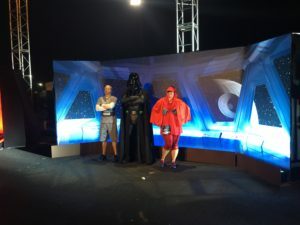 We arrived at the race early and had a little bit of time before we had to start heading to our corrals so we decided to get in line for a picture with the ultimate Dark Side character, Darth Vader. Soon after we took our picture they shut down picture lines and encouraged everyone to get to their corrals. Before heading to the corrals we were able to meet up with our friends Jill and Helene to get an idea of their race plans (and maybe plan some post race celebrations!). Helene was in the corral ahead of me so she decided to enter her corral and stay in the back and I would head to the front of my corral. I made my way up to the front of the corral and Helene was waiting for me at the barrier with her son, Soaren, who would be running his first half marathon (congratulations Soaren!). We were also able to be meet up with our friend Tracy at this point who decided to start at the front of her corral which worked out great because she was able to catch up to Mike so they could run together. Helene and Soaren had decided they wanted to get as many on on-course race photos as possible, so we expected that the characters were going to be the same as the day before and planned on them to wait for me right before mile 1 in the R2D2 line. As the corral before me began my corral began walking to the start line. Let me just stay starting at the front of the corral is amazing! Before starting my race I pulled my phone out to start my music and have it easily accessible to start RunKeeper (you have to get those New Balance points), but much to my surprise I had a text stating that I had already started the race. Upon talking to people around me they also received these same messages. If I were running this race for a PR or proof of time I would have been a little upset because it had me crossing the start line approximately three minutes before I actually did. I will start by saying I loved this course. I know many people were not happy with it and, don’t get me wrong, there is room for improvement. However, it was a nice change from the Donald Duck Half Marathon and the Princess Half Marathon course. Starting at the front of my corral made the first mile of the course awesome. It was so nice not to have to weave between people. By the time I reached Helene had Soaren at R2D2 I looked at my watch and realized I just ran a mile in the fastest I ever had. We spent a lot of time waiting for R2D2 and by the time we ran away I realized I had spent almost 15 minutes waiting for a picture. After this I let Helene know that I was going to keep running and not stop for more pics because my legs had really stiffened up in those 15 minutes and I had a hard time getting back in my running groove. 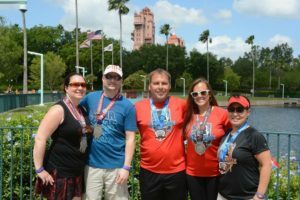 This is something to think about for those looking to get character pics in at a runDisney race. After R2D2 it was time to head into Epcot. However, unlike the Star Wars 10k, for the half marathon we turned left upon entering World Showcase and headed around most of the World Showcase Lagoon. After we left Epcot and headed onto the Boardwalk area after passing the Mile 2 marker, which was located around the Chewbacca meet and greet located just after the International Gateway entrance. Chewie had just as long of a line as R2D2 and I had already made the decision for no more picture stops, so on I went. During the half marathon we trotted toward Yacht and Beach Club instead of toward the Boardwalk like we had the day before, which made for a different course feature which I welcomed. Because i stopped for R2D2, the course had become more crowded and congested today than it had the day before for me and the path to Hollywood Studios became a little dangerous to be running on. There were some areas where I had to come to a dead stop because there was no way to run thru or around people. We encountered the Mile 3 marker before entering Hollywood Studios (DHS). It was right around the 5K marker that I felt that I was starting to get back into my running groove. We entered DHS, but, instead of having us immediately turn right toward Tower of Terror like the day before, we turned left and did a loop around Echo Lake before running in front of the Chinese Theater. This is where the stage for the new Star Wars show is located, and on that stage was Kylo Ren and a few storm troopers where people could stop and take pictures. Unfortunately, there were too few photographers here and again, the line was quite long. Race Icon. We headed down a small portion of Hollywood Boulevard and turned left onto Sunset Boulevard, where we were treated to another gorgeous view of the Tower of Terror. We turned right to head up a slight incline towards Fantasmic and made our way out of the park. In the Fantasmic theater a collection of CosPlayers were more than happy to have you stop and take pictures with them, which was a nice addition. We passed Mile 4 shortly after and turned left to head toward Osceola Parkway. During this time I really focused on my intervals and decided to go with a five minute run to a one minute walk. The stretch leading up to Mile 5 was exactly the same as the day before, which is to say that it is quite a boring stretch. This could have been a great place for a character meet and greet, but alas, there wasn’t one. The Mile 5 marker was right before the right turn that put us onto Osceola Parkway. It was now time to run two miles down to Animal Kingdom, which did involve a few overpasses, which were okay because as much as going uphill is not pleasant running downhill is just amazing! I continued my 5:1 intervals during this part of the race. I honestly do not remember what was on this part of the course as far as entertainment goes except for a screen projecting clips from the movies on an uphill climb, but I am informed that there wasn’t anything until just before the entrance to the Animal Kingdom parking lot. It was still dark for me at this point of the race so I was able to easily see the screen, however I could only imagine as the sun began to rise it would not be easy to see. Going under the Animal Kingdom welcome sign I could see the mile 7 marker just ahead and became excited that I was over halfway done with my race, but that feeling was quickly gone though when I looked to my right and could see the 15K (9.3 miles) marker. I could not believe I was going to spend two plus miles running in parking lots and only a small portion of time inside Animal Kingdom itself. I will say they had some great photo ops that were mainly just backgrounds in the parking lot of Animal Kingdom that I regret not stopping for after seeing Mike’s and Helene’s photos. (There’s always next year!) The mile 8 marker was in the parking lot right before heading to the backstage area of Animal Kingdom. Once backstage I realized I was at the halfway marker of the marathon course from January and was very excited that I had less than 5 miles to run and not the 13 more I would have had back in January. I had decided that I needed a bathroom stop and wanted to use an actual bathroom as opposed to a port-a-pot. Well apparently everyone had this idea because upon entering Dino-World the first bathroom stop was packed. Since I knew there would be one by the Finding Nemo theater I continued on, but unfortunately, that bathroom was blocked by a storm troopers photo op, which wasn’t the best of course planning. Fortunately I knew my next bathroom opportunity would be right after Expedition Everest. Woohoo! I had found a bathroom with no line. Getting back on the course I decided I needed to get my pace back up and kept a running pace the rest of the way in Animal Kingdom, which in doing so I missed some great photo ops with the River of Lights and Tree of Life. On our way out of Animal Kingdom there were some cosplayers once again, which unfortunately were at bottle neck part of the course and made it quite dangerous as runners were cutting over to take pictures. After leaving Animal Kingdom the Mile 9 marker was within sight! Stopping had messed with my running groove and I had a hard time getting back into my 5:1 interval in the parking lot section, and had to really play around with my intervals for a while. Once back on Osceola Parkway, by the time I hit the Mile 10 marker, I eventually found a great pace of a 2.5 minute run to 30 second walk that I would use until the end of the race. Time to spend almost another 2 miles on Osceola Parkway, this time though I was running directly toward the sun. I definitely wish I would have brought sunglasses with me. Before coming upon the Mile 11 marker I could see on the other side of the road the infamous balloon ladies right around the 10k (6.2 miles) marker. I had two thoughts. First, I was relieved to know they were far enough behind me that I had nothing to worry about. Second, I let out a chuckle when I saw them carrying Death Star balloons. Well played. Remember before when I said that I could imagine those video screens would be hard to see once the sun came up? Well I was right, heading toward Wide World of Sports I could barely make out the clips on the screen. Alright, time for the final stretch… we turned right onto an unpaved trail that would take us into ESPN Wide World of Sports and the Mile 12 marker was in sight. Now I have many issues with running in Wide World of Sports thanks to the marathon course and I just had to keep telling myself, I only have to run a mile in here not the three miles to which I have become accustomed. I truly cannot remember the last mile because I just wanted it to be over as fast as possible (which, when you are racing, is actually a good thing!). I wish I would have looked at my splits because I would guess my final mile may have been as fast as my first mile mainly for the fact I wanted to finish as quickly as possible I will say it again, there is nothing exciting about finishing a race here. This was the part of the course I did not enjoy. It is definitely way more exciting to finish in Epcot. Maybe for future races they will run the race in the opposite direction so that the ending is in Epcot…maybe? The half marathon SMO was amazing!!!!! It was a spinner with Darth Vader on one side and Darth Sidious on the other. The spinner had a red light saber going thu it. Describing it just does not give it the justice it deserves so feel free to analyze the picture. At the finish line we also received the Dark Side Challenge medal which you can read more about from Mike’s article. It was the typical RunDisney race ending. 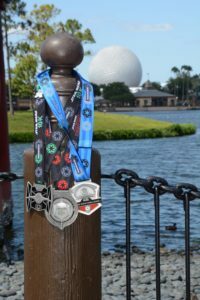 Pick up your half marathon medal, then water, then Powerade, challenge medal, finisher photo with medals, runDisney snack pack, and get your banana. I did not check a bag, but if I had I would pick that up next before leaving the runners only area. Upon leaving if you wanted to get more pictures with characters, they were to the left and to the right were buses waiting to take us back to our hotels. The walk to the charcters actually seemed longer than after the 10k but I think they were just routing traffic differently. I was ready for a shower so I made the decision to head back to the hotels and forgo pictures. Mike met me at our bus and we headed back to our resort to get ready for the day’s festivities. Like with the 10k, I made the decision to make my playlist alternate, going from a Disney song to a non-Disney song, and so on. I just added more music since 13.1 miles takes more than twice as much music as 6.2. My first song was the Star Wars Theme which was just amazing to start my race running to this with fireworks going off over my head. Next year I will definitely add more Star Wars music to my playlist. This is the first half marathon for which I am eligible to be “perfect” and I undoubtedly plan on maintaining that status. This is by far my favorite runDisney race weekend, but this may have something to do with it falling during my birth month and who wouldn’t want to celebrate their birthday at Walt Disney World?!?! I absolutely loved the themeing of the weekend and with more Star Wars movies on the horizon it opens even more possibilities of running costumes. I also am excited for the year that I can make it work so that I can run for the Kessel Run Challenge.